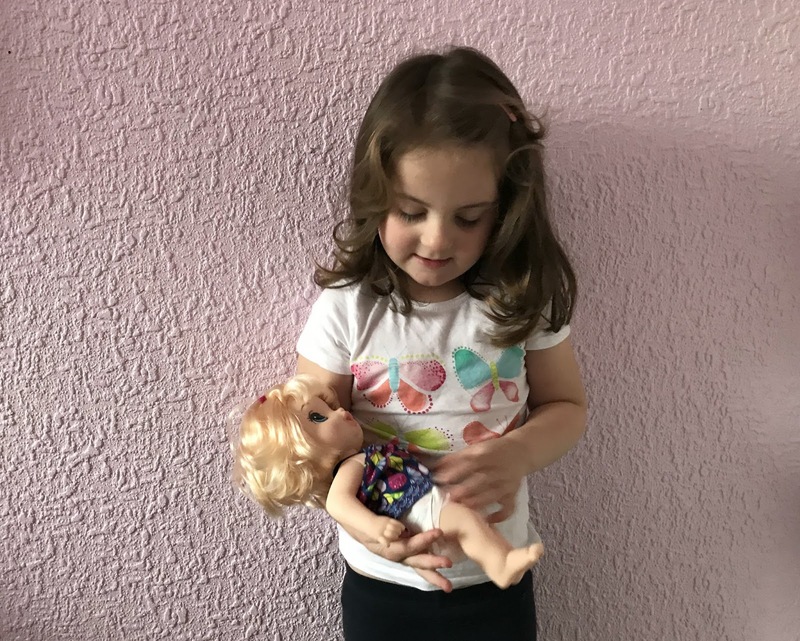 My 4-year-old daughter Sophia is doll and baby crazy at the moment, she currently has her heart set on being a babysitter when she is older and she spends hours playing with her baby dolls. Sophia has a lot of baby dolls but she has never had a Baby Alive doll before, although she has been after a one since her cousin got a one for Christmas. 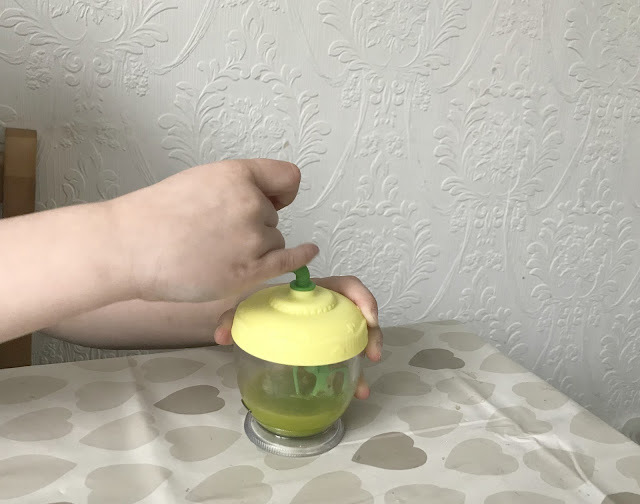 However, Hasbro recently sent her a Baby Alive Sweet Spoonful doll to review and this is what we thought. Baby Alive Sweet Spoonfuls baby doll is the latest doll in the Baby Alive range, the doll comes in seven different varieties with different genders, skin and hair colour dolls available. 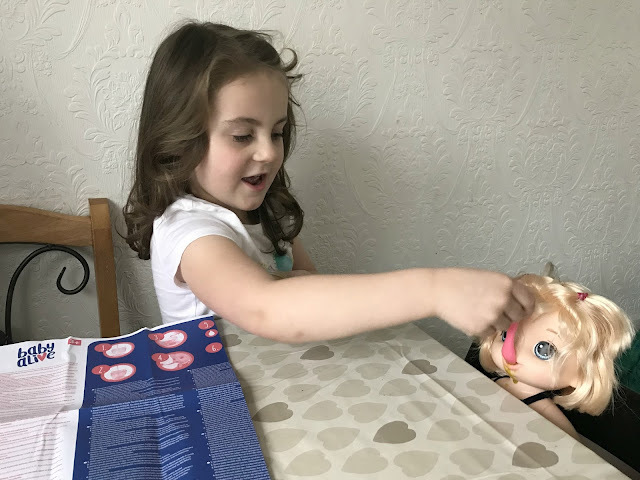 We were sent a little blonde haired doll to review and Sophia loved her at first sight. The doll has huge blue eyes, soft blonde brushable hair, movable limbs, she comes wearing a summer dress and she is just the right size and weight for little ones to hold. Baby Alive comes with a range of accessories such as two nappies, a bottle, hair comb, food blender, spoon and two sachets of 'food'. As you have guessed from the contents of the box Baby Alive Sweet Spoonfuls baby is not a regular doll, she is a doll you can feed and that poos! My children thought this was amazing and could not wait to play with her whilst they were housebound with chicken pox recently. As soon as we had the doll out of the box Sophia was trying to put a nappy on her 'baby' and she was begging me to fill her bottle with water and let her loose with the food so she could feed the doll. You only get two sachets of food with the doll so I would recommend only using a little of it when feeding the doll as the whole pouch would be far too much and cause a lot of mess, trust me! Making the 'food' is easy I simply added some water to the food mixer and poured some of the food mix into it and let my children mix it in the mixer. The food is a lovely bright green colour, much to my children's delight and they could not wait to feed the baby. After feeding the doll they give her a drink of her bottle to help the food work through her body and before we knew it she was pooping bright green poo in her nappy. My children were fascinated with this and they loved changing her nappy and cleaning her up, luckily it was odourless. Sophia has had hours of fun playing with her new Baby Alive Sweet Spoonfuls Baby Doll, she loves caring for her and practising being a babysitter for when she is a grown up. It would have been nice if she came with a few more packets of food or nappies although you can buy them online and at Smyths for around £5 each. 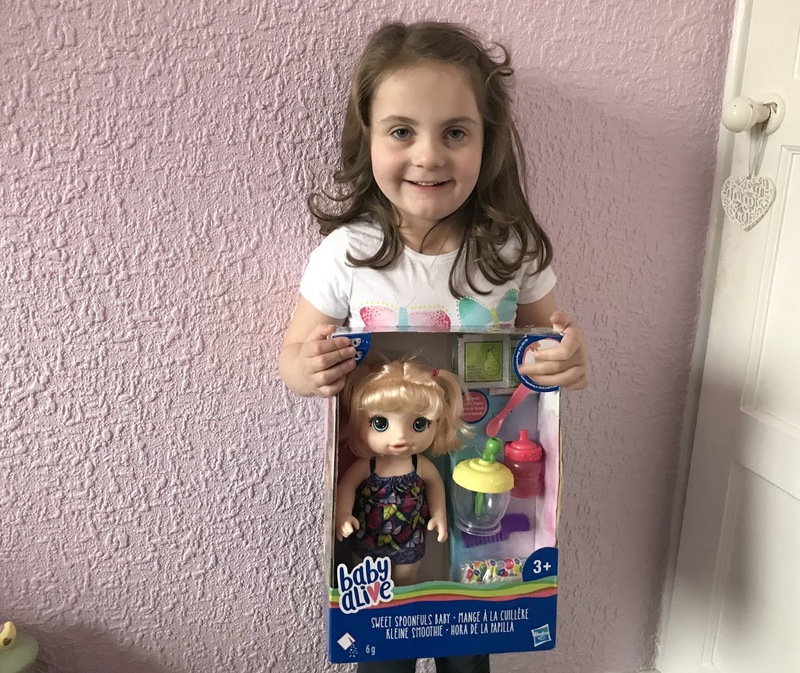 You can buy the Baby Alive Sweet Spoonfuls doll from Smyths, Argos, Amazon and all good toy retailers with an RRP of £25.99 so she is not too expensive. The doll is recommended for children aged 3 and over and I think 3-6-year-olds (and probably slightly older children) will have great fun playing with this doll. Disclosure we were sent this doll for the purpose of this review, however, all opinions are my own. That's hilarious. Quite realistic, my son would love it! I saw this advertised on tv the other day and thought how much my eldest daughter would love it :) Though I’m not sure I could trust her to keep a nappy on her! That’s a pretty realistic doll and I’d love to have a Baby Alive Sweet Spoonful doll! I’m obsessed with everything poo related at the moment (I’m 5 years old after all) this would be perfect for me! Oh my goodness, how realistic! I would have loved something like this as a kid!